Today, we had a great doctor's appointment checkup. Our little girl is continuously growing and so is my belly. I've gained more weight over the past few weeks than I have my entire pregnancy. It kind of upset me this morning when I stepped on the scale but they reassured me that I was on the low end of my weight gain. A total of 28 pounds to be exact!! (yikes) I feel so bloated and achey but I sill have my bursts of energy to go on my morning walks which keeps me a happy gal. Which brings me to the subject of this beautuful picture above. Lately, I've become somewhat dependent upon bubble baths. 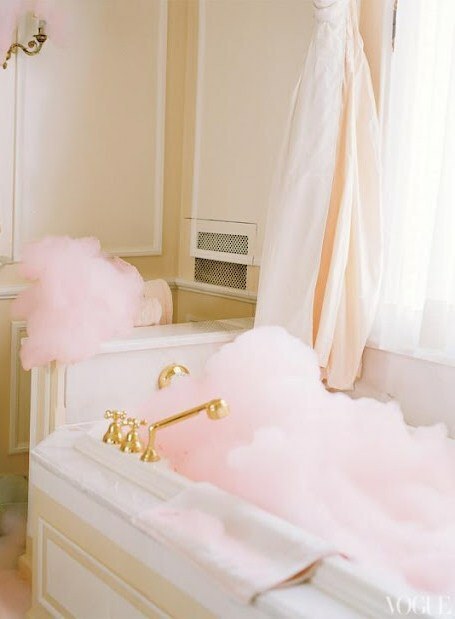 So, I am taking advantage of these quiet afternoon's by soaking in a bubble bath with a glass of sparkling water and my favorite tunes playing in the background.....pretending it's somewhat like this. Gorgeous, right!? What girl doesn't want to soak in a pretty, pink bubble bath?